At last one of the greatest mysteries of the Second World War has been solved. Since historian Hugh Trevor-Roper made his name with the publication of "Hitler's Last Days", it has been accepted that the Nazi leader killed himself as Allied troops closed in. Many have suspected that the story was incomplete and now, with the help of previously unpublished top-secret documents and images from the KGB archives, the last great secrets of World War II can be revealed. "Hitler's Death" presents graphic new evidence from Hitler's inner circle, testimony from Germans and Russians who participated in the battle for the Reichstag and evidence from those sent to arrest the Fuhrer. 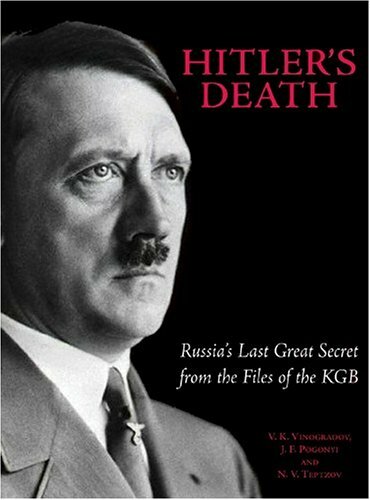 Fascinating verbatim records of the interrogation of the survivors from Hitler's bunker, vital classified internal reports to Stalin, plus the entire transcript of Martin Bormann's diary, combine to provide a unique insight into the death throes of the Reich "Hitler's Death" destroys the myths surrounding the last days of Hitler and pieces together the astonishing truth of the final days of Nazism. Vinogradov, V.K. ; Pogonyi, J.F. ; Teptzov, N.V.